256 SANSON, N. Partie de l'Inde au dela du Gange. . . [and] Presqu'Isle de l'Inde. . . Paris, P. Mariette, 1667. In original o/l colours. Paper slightly age toned. Some very light water staining and spotting. 190 x 250 mm. Je voudrais de plus amples renseignements sur le Lot N°25246 . 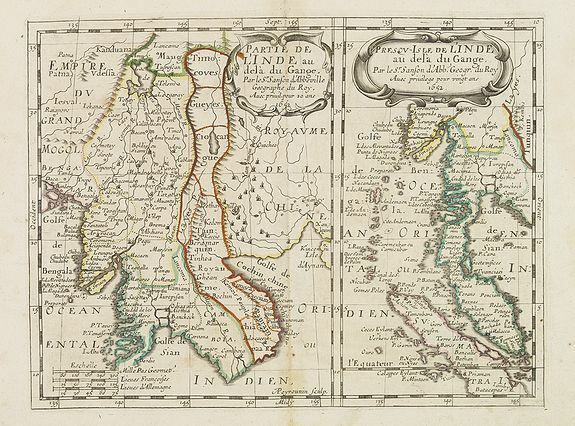 ¤ Two maps together on one sheet : to the left a map of Thailand and to the right the Malaysian peninsula prepared by N.Sanson and published by Pierre Mariette. 257 SERVICE GÉOLOGIQUE DE L'INDOCHINE. 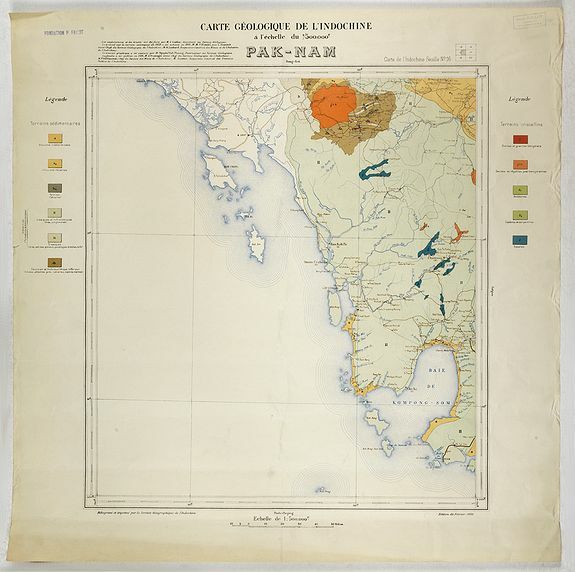 Carte géologique de l'Indochine à l'échelle du 1/500 000e. Pak-Nam Bang-Kok. Février 1939. Carte héliogravée imprimée en couleurs. Papier partiellement froissé. Cachet d'appartenance : Paul Fallot professeur au Collège de France. 530 x 482 mm. Je voudrais de plus amples renseignements sur le Lot N°64994 . ¤ Carte de l'Indochine Feuille N°16. Couvre la région depuis Paknam (Thailande) jusquà la baie de Kompong-Som (Cambodge). De part et d'autre une légende indique les terrains sédimentaires et cristallins. Héliogravé et imprimé par le Service Géographique de l'Indochine. "Les explorations et les tracés ont été faits par M. J. Gubler, Assistant au Service Géologique. Le travail sur le terrain commencé en 1928 a été achevé en 1933, M.M. F. Blondel puis L. Dussault étant chefs du Service Géologique de l'Indochine ; M. A. Lochard, Inspecteur Général des Mines et de l'Industrie de l'Indochine. Le travail graphique a été exécuté par M. Nguyen Vinh Phuong, Dessinateur au Service Géologique." 258 BERTIUS, P. Bengala. Amsterdam, 1602. Uncoloured. A verry good and dark impression. 84 x 124 mm. Je voudrais de plus amples renseignements sur le Lot N°6068 . 259 DE BRY, Th. XII. Delineatio Venationum, quomodo Nimir um Omnis Generis feras capiant. Frankfurt, 1609. Uncoloured. Text sheet with copper plate engraving with letter press in Latin. In very good condition, dark impression. 140 x 185 mm. Je voudrais de plus amples renseignements sur le Lot N°29821 . 260 DE BRY, Th. VI. Repraesentatio Bellorum, et Quomodo se ad Illa praeparent. Frankfurt, 1609. Uncoloured. Text sheet with copper plate engraving with letter press in Latin. In very good condition, dark impression. 138 x 186 mm. Je voudrais de plus amples renseignements sur le Lot N°29815 . 261 DE BRY, Th. 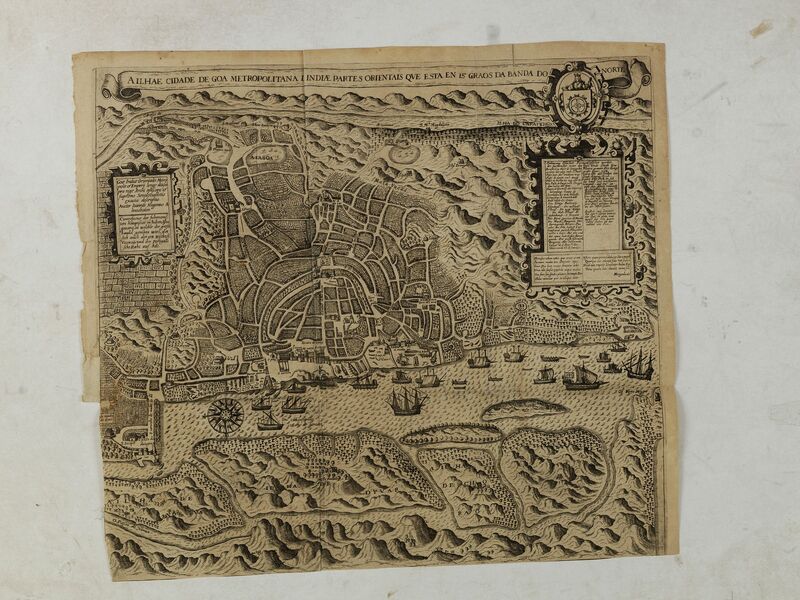 Ailhae cidade de Goa metropolitana da Indiae.. Frankfurt, 1613. Uncoloured. Lower margin and lower part left margins cut on neatline, as issued. On verso piece of paper pasted to back vertical tear, 12cm. Into the engraved area. 383 x 430 mm. Je voudrais de plus amples renseignements sur le Lot N°32164 . ¤ One of the earliest printed detailed plans of a European trading post in the Indies, this finely engraved and designed bird's-eye plan was published in De Bry's important collection of Minor Voyages . Finely engraved strapwork cartouches enclose the title, descriptive panels and coats of arms, ships, houses, mountains, forests and elephants working on the quayside are well detailed. Goa was the first territorial possession of the Portuguese in Asia and it was intended as a colony rather than a fort, being granted the same civic privileges as Lisbon. The city reached its climax of prosperity from 1575 to 1625 with merchandise from all parts of the East displayed in its bazaars, pearls, porcelain, silk, drugs, spices, etc. In the main street slaves were sold, the houses of the rich surrounded by gardens and palm groves. A fascinating and uncommon item. 262 ROSSI,G.G. L' India di qua e di la dal Gange oue sono li Stati del G. Mogol e parte del Imperio del fu prete Iann.. Rome 1683. Uncoloured. A dark impression. Marginal light staining. Unfolded sheet. 414 x 522 mm. Je voudrais de plus amples renseignements sur le Lot N°17786 . ¤ Uncommon map of northern part of India, Bangladesh, extending from Pakistan to Bhutan and across to Burma. From his 'Mercurio Geografico…'. The engraver was Franciscus Donia Messis. Rossi is giving credit to Tavernier, Mandeslo and the Jesuits in the large title cartouche upper right. 263 ROSSI,G.G. L' India di qua e di la dal Gange oue sono li Stati del G. Mogol e parte del Imperio del fu prete Iann.. Rome, 1683. In original o/l colours. A dark impression. Marginal light staining and age-toning of paper. 414 x 522 mm. Je voudrais de plus amples renseignements sur le Lot N°26608 . 264 CORONELLI, V.M. Impero del Gran Mogol. Venice, 1690. Uncoloured. Printed on thick paper. 450 x 595 mm. Je voudrais de plus amples renseignements sur le Lot N°31831 . ¤ Northern India, with Pakistan, Bangladesh and the western part of Burma. Including Cabulistan, Kandauna, Harduari, Binsola, Burchar, Kachemire, Iamba, Ragepor and others. 265 SANSON, N. Persaru../ India Vetus intra et extra Gagem.. Paris, 1702. In original o/l colours. Good impression. Two maps printed on a double page. Wide margins. Mint. 184 x 270 mm. Je voudrais de plus amples renseignements sur le Lot N°6429 . ¤ Two maps together on one sheet. The first depicts ancient Persia and the second north India from the gulf of Bengal to the border of China. Engraved by L'huillier. 266 DONCKER, H. De golf van Bengalen. Amsterdam, after 1669-1712. Uncoloured. Paper slightly age-toned. With some plate scratching and ink toning. 434 x 520 mm. Je voudrais de plus amples renseignements sur le Lot N°25909 . 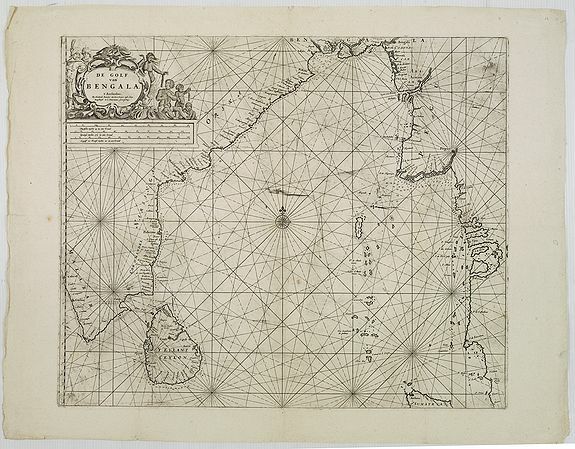 ¤ Rare chart of the Indian Ocean, with compass roses and system of rhumb lines, soundings and anchorage's. Many place names. The plate was newly made by Doncker, in an early stage he used the copperplates of Goos. More frequent than Goos, Lootsman, Van Loon, and others contemporaries, Hendrik Doncker corrected and improved charts. 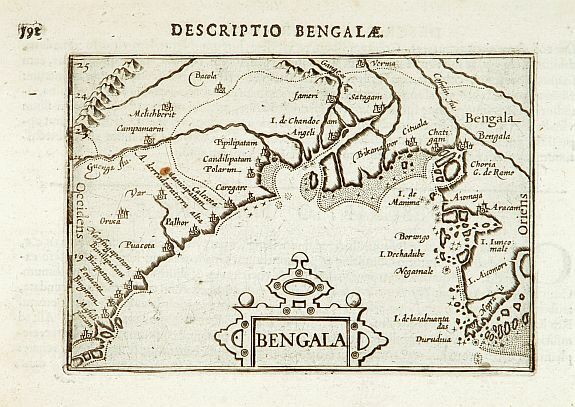 As a result this map is much updated than the Jansson (1658) map of the Bay of Bengal Koeman, Atlantes Neerlandici, Vol. IV, Don. 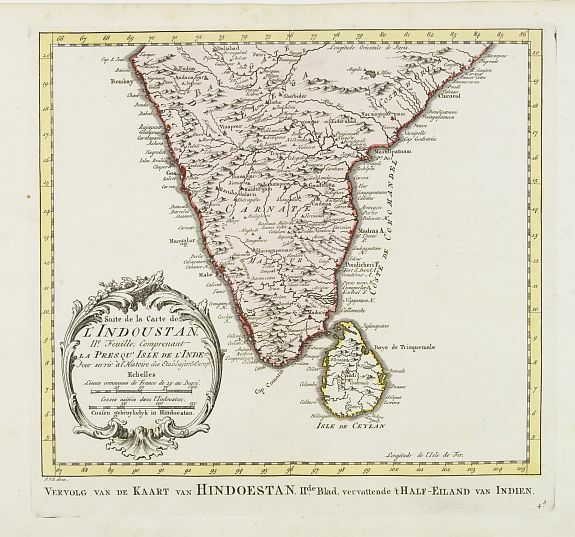 [map 46], Gole Early maps of India, 19. 267 CHATELAIN, H. Vue et Description de Quelques-Uns des Principaux Forts des Hollandois dans les Indes . Amsterdam, 1720. Uncoloured. Some light browning along center fold. Very good impression. 370 x 432 mm. Je voudrais de plus amples renseignements sur le Lot N°31603 . 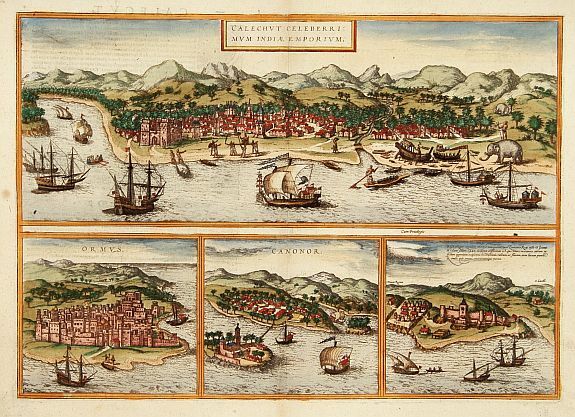 ¤ Interesting sheet with seven detailed views illustrating the most important Dutch trading outposts and fortified colonial possessions in the East Indies, including 4 harbor views Batavia (Jakarta), Amboina, Ternate, and Solor, and 3 fort plans, with descriptive French text, from Chatelian's monumental 7 volume Atlas Historique. In upper right margin: 'Tom. V. Nro 48. Pag: 128. Henri Abraham Chatelain (1684 – 1743) was a Huguenot pastor of Parisian origins. He lived consecutively in Paris, St. Martins, London (c. 1710), the Hague (c. 1721) and Amsterdam (c. 1728). 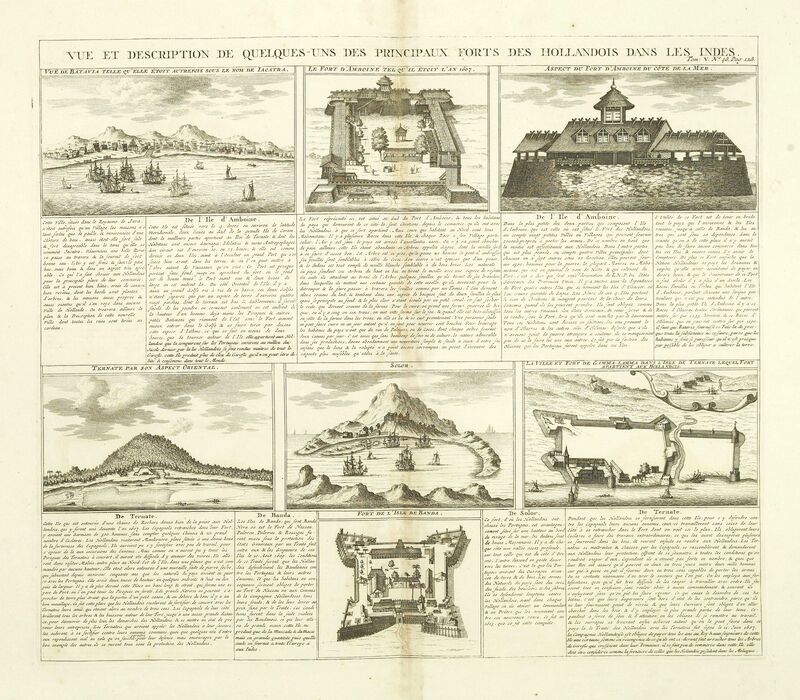 He is best known as a Dutch cartographer and more specifically for his cartographic contribution in the seminal seven volume Atlas Historique, plublished from 1705 to 1720. 268 HARREVELT,E.van/ CHANGUION,D.J. Suite de la Carte des L'Indoustan, Iie Feuille.. Amsterdam, 1773. In attractive original o/l colours. Minor spotting upper margin, hardly noticeable. Good condition. 223 x 240 mm. Je voudrais de plus amples renseignements sur le Lot N°23838 . 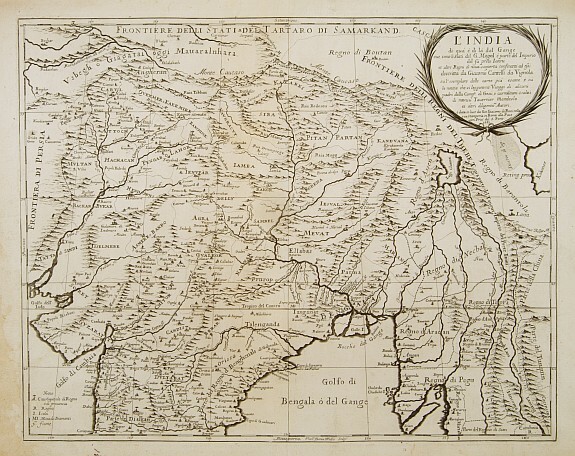 ¤ Uncommon edition of this fine map of India.In lower right engraved "4b." 269 APRES DE MANNEVILLETTE, Jean-Baptiste-Nicolas-Denis d' [Seychelles].Carte réduite de l'Océan Oriental Septentrional … avec les Isles de Ceylan, Maldives et Laquedives [ au verso carte manuscrite des Seychelles]/ Plan des Isles Mahé [ au verso carte manuscrite de Praslin]. Paris, ca 1775. Pâle mouillure dans la marge inférieure de l'Océan oriental, pâle mouillure et petite tache brune sur la carte de Mahé (335 x 485 mm). Cartes manuscrites (à la plume) des Seychelles et de Praslin au verso des cartes. 480 x 660 mm. Je voudrais de plus amples renseignements sur le Lot N°63857 . ¤ Cartes publiées par D'Après de Mannevillette dans son "Neptune oriental". Au verso de la carte de l'Océan oriental, une carte des I. Seychelles est dessinée à la plume ; au verso de la carte de Mahé, une carte de l'île Praslin également à la plume. Ces cartes manuscrites des Seychelles avec indications des sondes, se complètent et semblent avoir été réalisées par un professionnel. - French charts of the coast of Indian ocean with a part of Africa, of Arabia of Persia, of India / of Mahé. Prepared by Jacques-François L'Abbé Dicquemare (1733-1789). D' Après de Mannevillette (1707-1780) was a famous French sailor and hydrographer. During a voyage to China in 1728 he succeeded in correcting the latitudes of many places using new instruments. Back in France he devised a plan to correct and publish all the existing maps of the route to China: the Red Sea, the coasts of India, Malaya, the northern parts of Indonesia, Indochina and China. 270 [No title] Indian meeting. . In original colours. Good condition. Paper age-toned. 272 x 193 mm. Je voudrais de plus amples renseignements sur le Lot N°29102 . ¤ Engraving presenting indian meeting. 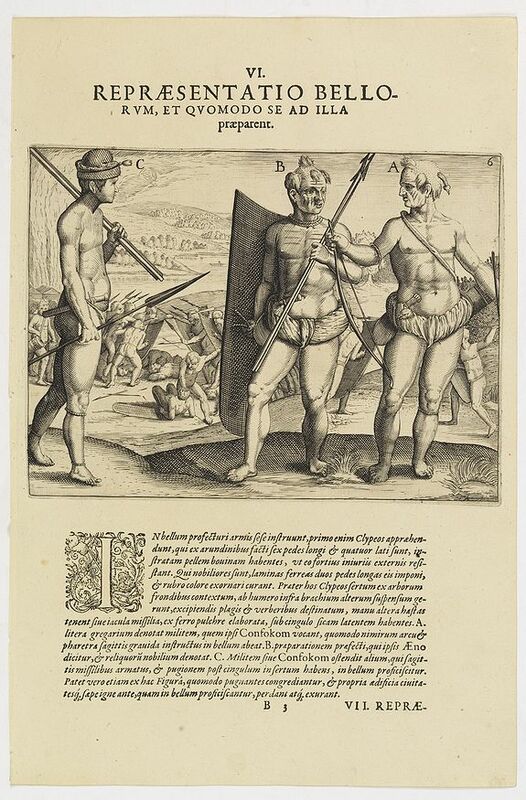 271 BRAUN, G. / HOGENBERG, F. Calechut / Ormus / Canonor.. Cologne, 1580. Beau col. 4 vues grav. sur le même cuivre. Texte latin. 335 x 480 mm. Je voudrais de plus amples renseignements sur le Lot N°60521 . ¤ Four panoramic views on one sheet: the upper approximately two-thirds of this double page sheet contains a fine panoramic view of Calicut which is on the west coast of India in Kerala. An elephant with a mahout is watching while boats are constructed on the beach, and Asian and European vessels just offshore are shown in some detail. The lower third is divided among three other views, Ormuz at the entrance of the Persian Gulf, Canonor in India, and the Portuguese fortress of El Mina in West Africa. From the greatest publication in this genre!. The Civitates was compiled and written by George Braun, Canon of Cologne Cathedral. Braun gathered together vast amounts of information and draft plans to produce over 500 city views/maps published in six parts between 1572 and 1617. 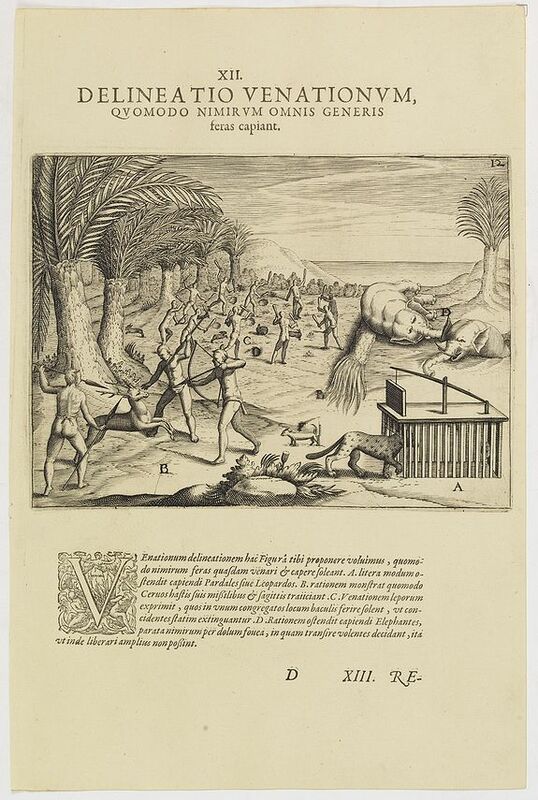 Most of these engravings were made by Simon Novellanus and Frans Hogenberg, many after drawings by Joris Hoefnagel. 272 JYLBERT LAOS Région Nord. France, 1943. Printed colours with pochoir. Colour lithography with pochoir (stencil) print in vivid colours. 345 x 242 mm. Je voudrais de plus amples renseignements sur le Lot N°28760 . 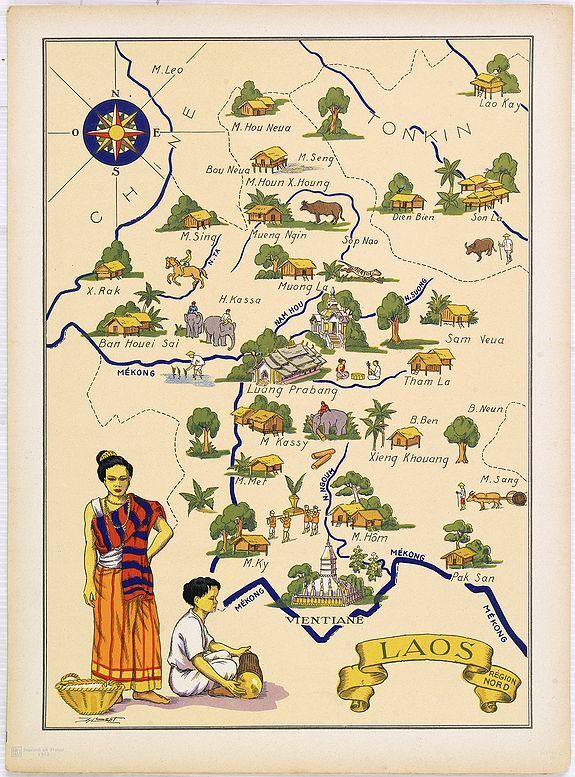 ¤ Very decorative, informative map of the northern region of Laos. With a compass rose in upper left corner, the map is filled with buildings, animals, figures and two locals in their typical dress. 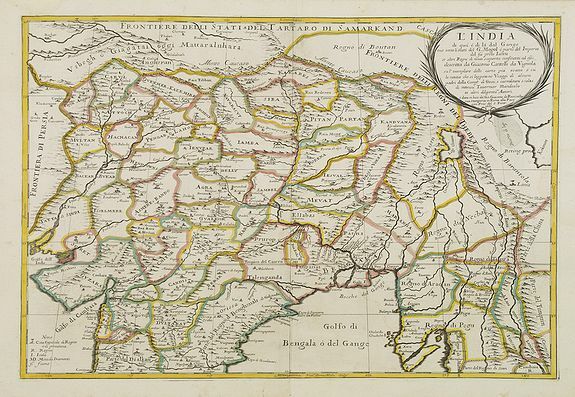 273 BLAEU, G. India quae Orientalis. Amsterdam, 1645. Original colours. A fine copy. With French text on verso. 410 x 503 mm. Je voudrais de plus amples renseignements sur le Lot N°774 . 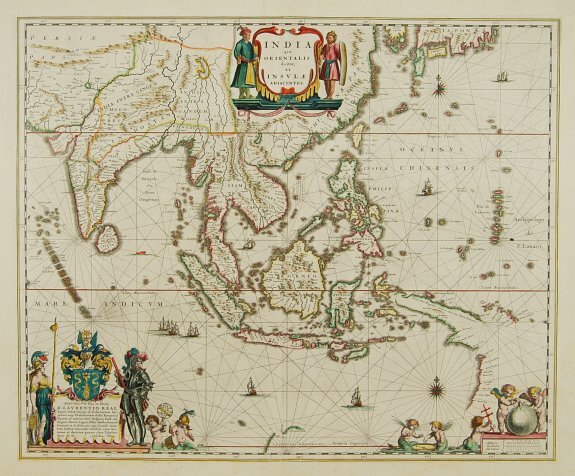 ¤ The map covers the area from India to Japan, with the East Indies. It was the first popular map to depict part of Australia (together with New Guinea) i.e. at bottom right the west coast of Carpentaria and the NW top of Australia with the following names: 't Hoge Landt, Rivier van Speult, Rivier Batavia, Water plaets, Rivier Coen, Vereenighde Rivier, Rivier Nassau, Staten Rivier, G.F.de Wits landt, Willems Rivier, 't Landt van D'Eendracht. - Tooley, The Mapping of Australia, 223. 274 CHATELAIN, H. Carte de l'Ile de Java. Amsterdam, 1720. Coloured. Printed from two plates. Paper slightly browned. Very slight oxidation due to offsetting of ink. Small hole (8x8mm.) filled in. A good and dark impression. Wide margins. 376 x 865 mm. Je voudrais de plus amples renseignements sur le Lot N°31300 . 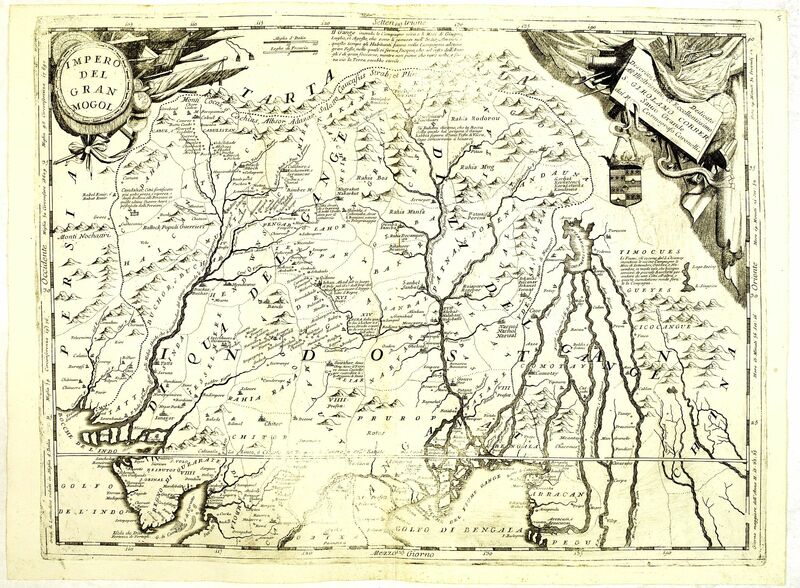 ¤ An inset plan of Batavia and clearly indicated rice fields, mountains, forests, towns in profile and even elephants suggest the wealth of detail found on this map. Modeled on Hadrien Reland's important Dutch map of a few years earlier, the superb topographical detail is complemented by drapery style cartouche and side panels which provide a full French text description of the island, its topography, history, flora, fauna and inhabitants. One of the finest large-scale maps of Java, giving good information regarding the V.O.C. settlements, each indicated with a flag in national 3-colour. 275 PROBST, G.B. 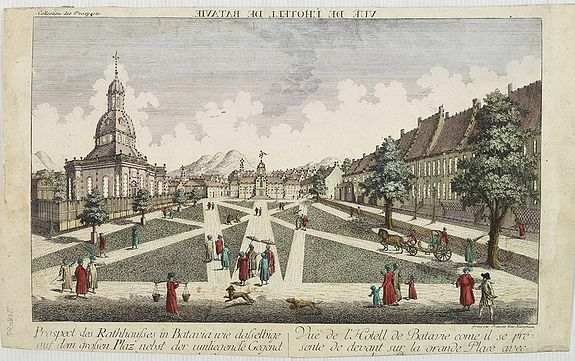 Vue de L'Hotel de Batavie.. Augsbourg, 1750. Original colours. Lower margin cut off, lower line and name of the publisher lost. 268 x 398 mm. Je voudrais de plus amples renseignements sur le Lot N°3651 . ¤ A so-called optical print of Fatahillah Square in Jakarta, Indonesia, prepared for use in a light-box or an amusing light-show. This richly hand coloured print is much perforated, windows are cut out, and then a thin transparent paper is mounted at the back and tipped with colour over the perforations. A view of present-day Fatahillah Square in Jakarta. The "Raadhuis"- headquarters of the V.O.C.- nowadays the Jakarta museum - is clearly visible in the centre of this print. Rare. 276 LA PEROUSE, J. F. G. Vue de cavite dans la Baie de Manille. Paris, 1798. Uncoloured. In good condition. Good margins with some light spotting, dark impression. 270 x 400 mm. Je voudrais de plus amples renseignements sur le Lot N°34059 . 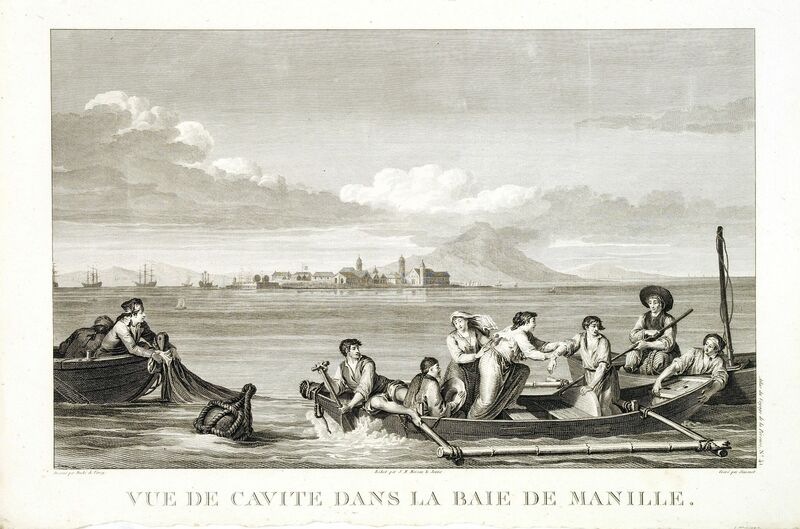 ¤ Two boats and passengers with Cavite Philippines in the background as it was seen from Manila Bay in January 1787. After a design of Gaspard Duchè de Vancy and engraved by Simonet. Made during the Voyages of La Perouse who set sail from France in 1785 to continue the discoveries of Captain Cook. He was shipwrecked in 1788 but his narrative, maps, and views survived and were published in 1797 in "Atlas du Voyage de la Perouse". 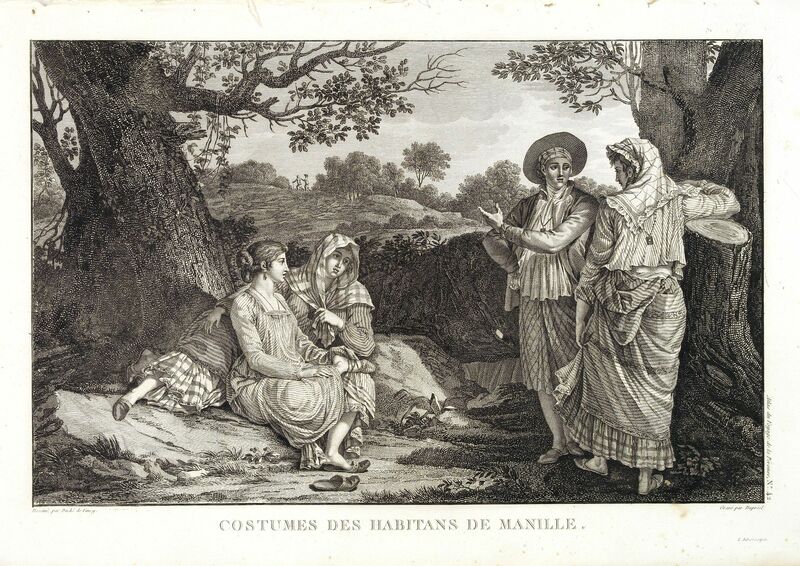 277 LA PEROUSE, J. F. G. Costumes des habitans de Manille. Paris, 1798. Uncoloured. In good condition. Good margins with some light spotting, dark impression. 265 x 400 mm. Je voudrais de plus amples renseignements sur le Lot N°34058 . ¤ A very beautiful print, showing four elegant figures relaxing in a shady glade, two women recline and two stand chatting. After a design of Duché de Vancy and engraved by Dupréel. Made during the Voyages of La Perouse who set sail from France in 1785 to continue the discoveries of Captain Cook. He was shipwrecked in 1788 but his narrative, maps, and views survived and were published in 1797 in "Atlas du Voyage de la Perouse".